Small machines don't always skimp on power. The MicroMag was designed to be as powerful as our larger models, but with a smaller frame and tank capacity. These MicroMag Floor Scrubber Dryers are great for smaller machine shops, retail stores, and janitorial companies that clean bathrooms. This small machine can get almost anywhere. 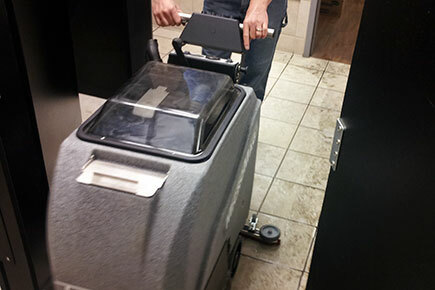 MicroMag's allow the Operator to even walk into bathroom stalls to easily double the normal speed it takes to clean a bathroom's floor. 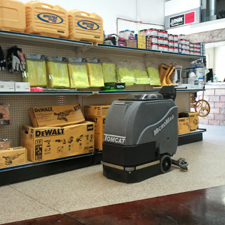 Because the MicroMag is so small, they make great machines for Auto Garages to have because of the simplicity and power to clean easy oil spills. 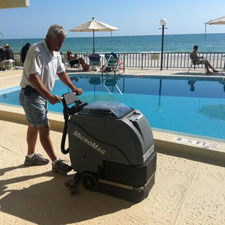 Based off of our very popular, and once a staple of the industry, Magnum Scrubber Dryer, these small machines don't skimp in cleaning power. 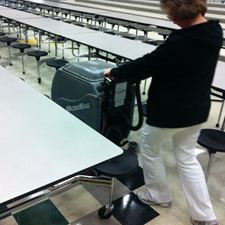 The MicroMag can easily fit into tight rows of chairs so the operator can work around objects more easily, this allows for faster speeds in getting jobs done. 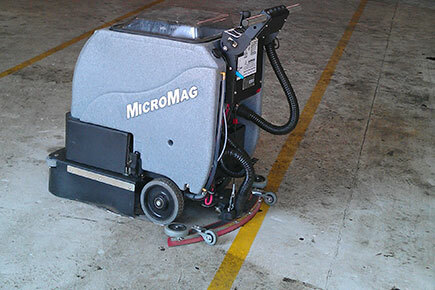 Tomcat's MICROMAG Scrubber Dryer was designed based off of our already well known MAGNUM and MINIMAG. 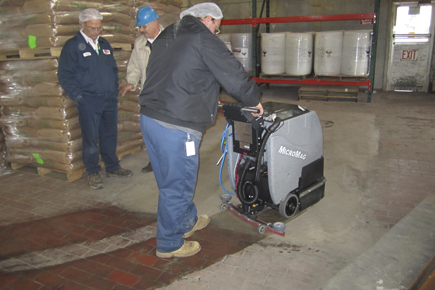 Our goal with the MICROMAG Floor Scrubber Dryer is to have the smallest Scrubber Dryer available without sacrificing on solution tank space or productivity in terms of scrubbing performance. 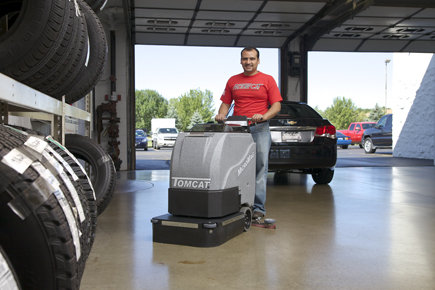 Tomcat's MICROMAG Scrubber Dryer comes equipped with either a Brush-Assist drive which allows for operator ease with little-to-no pushing, or a Traction drive which includes a powerful all-gear transaxle for climbing ramps and max operator ease. 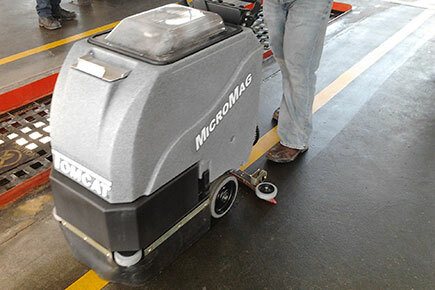 While keeping with the constant durability that Tomcat machines have to offer, your operators will find the MICROMAG Scrubber Dryer easy to use, as there is an adjustable handlebar for all heights of operators, and easy to maneuver into tight areas. The deck is protected by a 10 gauge steel frame and polyurethane rollers to keep the unit from marking walls. 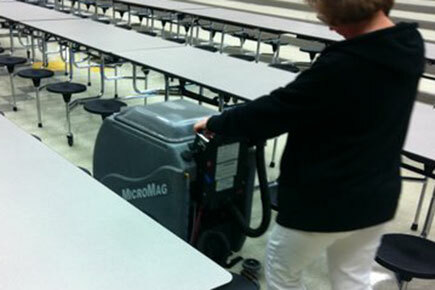 Just like these images display, the MICROMAG Scrubber Dryer is applicable wherever the job is needed. In small hard to reach areas in warehouses and factorys, cleaning tile floors in a public area in a mall, of even in a small machine shop. These convenient and simple machines don't skimp out when it comes to getting the job done right!